I am a very lucky woman, because my husband Mike loves keeping birds as much as I do. Lately he has become the main caregiver to our flock. And that sparks his creativity in many ways. 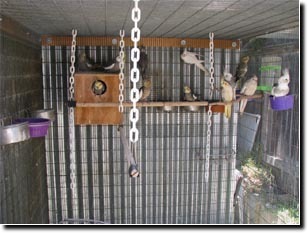 Our large aviary is outdoors, and Mike modified it by attaching sheets of corrugated steel. These create a protected corner where the birds can go to get out of the wind or rain. There is no heating in the flight, but California rarely gets freezing cold temps even during winter nights, and if we do have a bit of that, it never lasts long. 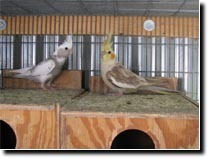 We put our breeding cockatiels there, many of which are rescues, birds given to us, or rehomed for a small fee. We had several nice clutches of pretty chicks this spring of 2011. One nest box remains, waiting for the last fledgling to leave. Looks like he or she will be a pretty white face silver. Mike and I both want the birds to have as natural a setting as possible. I have a small eucalyptus tree in a pot just outside the aviary, and two small palm trees. The birds can nibble the ends of branches and fronds, and I turn the plants if one side gets too much cockatiel pruning. This also gives them shade without blocking a cool breeze in the summer. We have a small aviary attached to the large one as an air lock. It's such a relief to have that extra safety so the birds can't escape. Just inside the door to the main aviary, there is a hanging manzanita swing that is triangular. Mike made a 2-inch high, 16 inch long flap through which I can pass fresh greens and even clip millet to the chain of the swing. 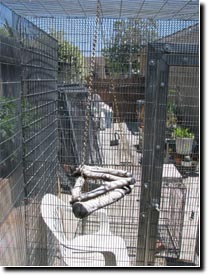 Long before we had the aviary set up, I had a plan for an old iron cage of mine. 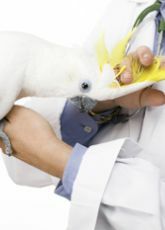 It's not good to put hookbills in round cages, or probably any bird at that. They love corners to hang in. But this round cage was perfect to go inside the aviary. 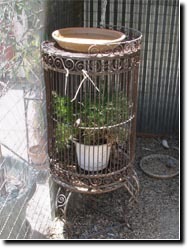 I put an asparagus fern inside it, and allow the plant to grow out through the bars. The birds love to nibble on it. The flat top of the cage is the perfect spot for a splash dish of water. It's easy to clean the dish out frequently with a little water pressure, and the plant gets lots of moisture without being pooped on all the time. Recently we were given a pair of button quail, to help keep the floor of the aviary a little cleaner. I am so entertained by these little birds, and apparently the cockatiels are as well. 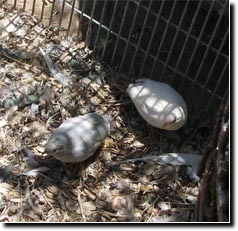 They are spending more time on the ground in the aviary, not bothering the quail who equally don't bother the cockatiels. One of our �tiels often sits halfway down the side of the aviary, just watching the quail run around. I wanted the quail to have a safe area where they could get away from the cockatiels if needed, and where their food and water would be theirs alone. I have lots of small cages that are not any use for keeping birds. I arranged two in a corner of the aviary and put small potted plants inside each one. 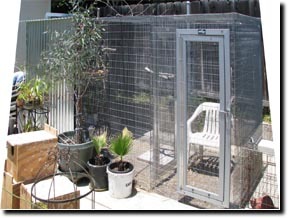 This gives a little shelter for the quail, a little privacy, and again the plants will only be nibbled on if they grow outside the cage. Currently I am using succulents, but may trade out other safe plants like spider plants or even birdseed grasses. When the breeding season was underway, we had rows of nest boxes on one wall and the back, in the sheltered end of the aviary. Getting enough perches in while leaving room for us to feed and clean was a challenge. Mike thought about it, and came up with a wonderful design. Whenever we get a birdcage with dowel perches, we take those out and use natural branches instead. Using one of those for the perch, Mike attached binder clips at either end, and then swung the arms of the clips up so the clip is locked in place. 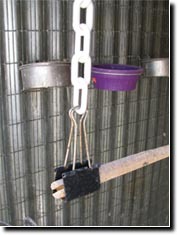 A length of plastic chain at each end is attached to the arms, and then attached to the roof of the aviary. The perches swing free, and the birds love it. They do chew the dowels, and that is great because it makes the dowels uneven, more like regular branches. And there are plenty more for replacements. I'm lucky to live in Southern California where the weather favors keeping birds outside. 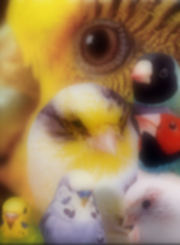 I'm lucky to have been given a wide variety of beautiful birds. And I'm lucky to have a husband who is an aviculturist and a handyman. 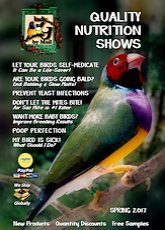 I hope you have enjoyed reading about my aviary.